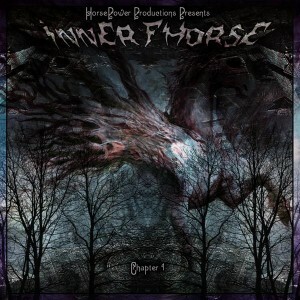 HorsePower Productions proudly presents their 10th release, their first dedicated entirely to night-time psychedelics: Inner Fhorse Chapter 1. In this 12 track compilation the label takes you on a ride through some of their absolute favorite artists dedicating their productions to find and activate your inner force. Through the ride we pass many sensational styles, staying true to night power and attracting your attention from beginning to end. This is the first chapter out of three so stay tuned if you enjoy this one! Mastering by Xikwri Neyrra with artwork by Shiva Om. MP3 Download | FLAC Download | WAV Download · Download count: 9,394.
congrats to all the producers and the label ! Wow, refreshing! Some great sounds!!! Hi, the download of the mp3 version contains an additional track, that isn’t listed in the tracklist. The second track in the download is “Nomad 25 vs Komfuzius – Matrix”. Additionally, the third track is named “Metaphyz – Jungle’s Rules” in the download version, but it’s named “Metaphyz – Jungle Fever” in the tracklist. Thanks for noticing that. I corrected the track list on the site to match what’s in the package. great tune from alien chaos! Hi my friend, thank you for this great work, really nice tracks!!! !